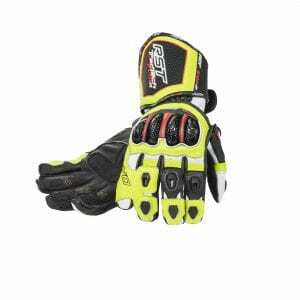 Motorcycle Race Gloves – Top 12! Racing gloves, for good reason, have always been one of the trickiest things for manufacturers to create, because no other limb or appendage has the same wealth of movement to accommodate. And, at the same time, they must be as protective as possible without being restrictive, but also allow a huge amount of feel, too. Not an easy ask when you think of it in those terms, nor is it a surprise that the now venerable race glove often takes a little longer to break in than mittens for other disciplines, or time of year. Like any other product in our market, we have those at the ‘bottom’ and those at the ‘top’, in terms of specification and prices. 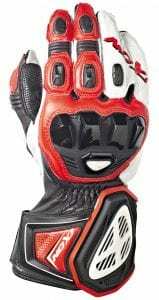 But, even the ‘cheap’ gloves are now brilliant, offering similar spec’ to top drawer offerings. And when we say cheap, we don’t mean £20 bargain bin fare – avoid like the plague, with decent gloves not costing the earth there’s no excuse to ever pick up that kind of woeful tat, and shame on you if you do, on your head (or hands…) be it! For now, here’s a selection of the very best at all sorts of price points – enjoy! Knox’s Handroids have been a favourite here at FB for years, for many reasons. They’ve been very affordable for top-notch gloves, have displayed excellent protection during crashes and never stand still for long, hence the new 3.0 version. These have extra kangaroo leather on the palm, new box seams and accordion stretch panels, and leather shields over the BOA closure system straps. The glove is designed so no matter where your hand may impact, there’s protection, and the wrist-protectors alone after using them can make other gloves feel a bit naked in that area. Added to that is superb comfort levels and the techno looks to wrap up a very impressive package. Available in sizes XS-XXL. A’stars have other less pricey race gloves available (The GP Tech & GP Pro R2 – £249.99 & £199.99 respectively), but the Supertech is their very best. It’s made from full-grain kangaroo and goat leather, has pre-articulated finger/thumb fourchettes and ergonomically engineered Arshield reinforcements. It has TPU finger sliders, a finger bridge between the third and fourth digits and comes in sizes S-XXXL. 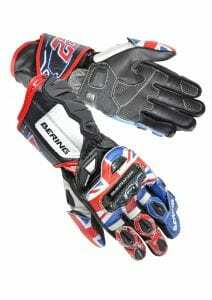 Sam Lowes’ latest racing gauntlets come from Bering, who have created this replica version. 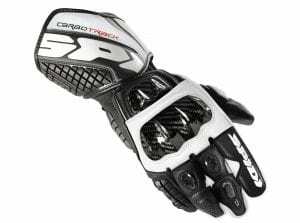 They have a polyester lining, a Keprotec palm with a ‘digital’ grip and carbon-shell reinforcements to compliment the scaphoid protectors. Seams and the linings are made from Kevlar, it has an anti-tear little finger system and comfort foam around the thumb. Available in sizes S-XXXL. The cheapest glove on the page, don’t think this means the BR30 isn’t worth your time. If you’re very short on dollar, Buffalo offer a decent specification for very little outlay. They’re made from full-grain leather with a polyester lining, have TPU reinforcement on the knuckles and fingers and the palms are leathered in twin layers. They come in black with neon yellow, white, red or blue, in sizes S-XXXL. 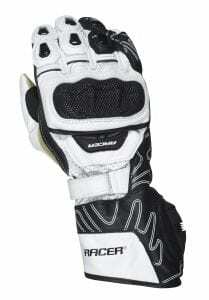 The Racer glove benefits from using Knox protection, specifically on the thumb joint and scaphoid bone. TPU protectors take care of the wrist, and a tunnelled knuckle protector is also in evidence. The glove is made from a combination of kangaroo and Pittards leather, they’re well ventilated and having used them here at FB we can attest to their build quality. They’re not a well known brand but, trust us, well worth seeking out. Available in sizes S-XXXL. Made from Analine leather, the Predator II sports external moulded knuckle protectors with a cantilever knuckle system, and pre-curved fingers. It has TPU/carbon mould protection, density foam and Keprotec inserts, plus stretch and perforated panels, too. 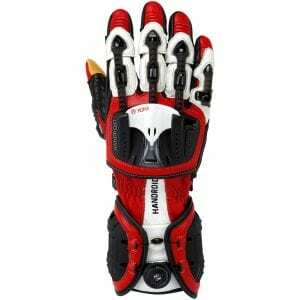 They are brilliant gloves for under £80, just handling them gives an idea of the quality on offer. They come in red, platinum, green, blue or black, and in sizes S- XXL. 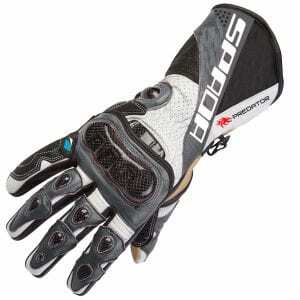 The Carbo Track is a beautifully presented glove, built from 0.6-0.8mm thick, high-performance vented leather. It has a Keramide reinforced back, palm support and reinforcements throughout, and ‘warrior’ shields externally. 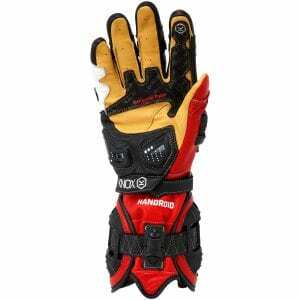 It uses an ergonomic, silicone based and highly shock-absorbing material in the right areas, extra padding in the palm and dynamic kinematic knuckle protection. They come in white, black/white, black/red, black or black/green, in sizes S-XXXL. 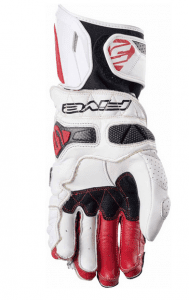 A long trusted brand, Weise’s Barracuda glove scorches in under the £50 mark. These have been designed in collaboration with Weise supported BSB and TT racer Peter Hickman. They feature integrated TPU reinforcement on the knuckles and fingers and, like many others, a twin-layer palm. It has a silicon print on the palm, too, for extra grip, and comes in sizes XS-XXXL. 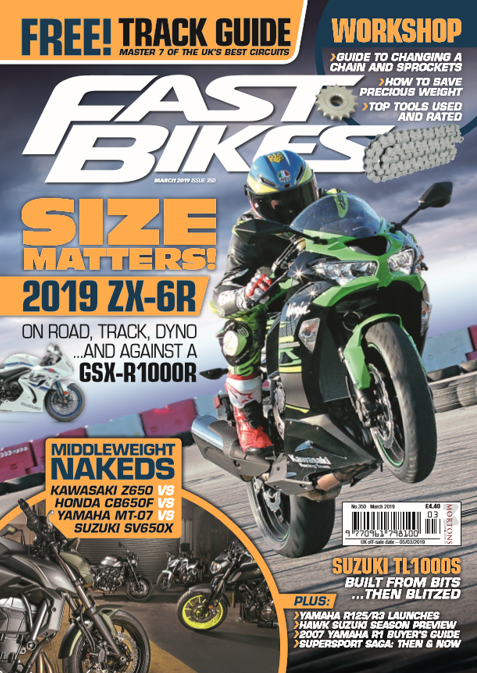 A single penny less than a ton buys you RST’s Tractech Evo Race, a glove you can see worn by many a racer in BSB and other paddocks around the world. It features a kangaroo leather palm which is thin enough for excellent levels of feel but thick enough to offer excellent abrasion resistance. The carbon knuckle guards have a unique memory elastane protector beneath them, plus there’s also stretch panels and ventilated fingers. They come in white, black, blue, green and red, in sizes XS-XXL. The Furygan FIT-R UK is, according to the press release, a tribute to ‘the great British riders who raced – and won – wearing Furygan’. So they sport the patriotic red/white and blue, on top of a construction with a goat leather palm, featuring external protectors for the scaphoid and metacarpals, and multiple double-leather reinforcements. The outer fingers are bridged, and finger stitch seams are positioned on the outside for better protection and comfort. Available in sizes S- XXXL. We’ve heard the odd horror story about Five’s cheaper gloves, but none regarding this flagship model at all. 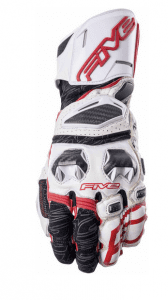 Five’s top glove is an incredible thing, with an incredible price tag to match! The sheer level of technology and material that’s gone into these remarkable mittens is impressive. It uses a cowhide upper and goatskin between fingers, with sheepskin on the full-grain leather palm. It’s rammed with carbon-fibre and Kevlar reinforcement, among many other features. Read the full-spec on their website and you’ll realise why they’re expensive. Available in sizes XS-XL. Ixon’s RS is made from a mixture of kangaroo, goat and cow hide, with extra kangaroo palm reinforcements and DuPont Kevlar thread which is backed up by a glued liner. It has an ‘exclusive’ vented knuckle protector, Pisiform and scaphoid protection, a long cuff and sliders at the bottom of the palm. A really nice glove, available in sizes XS – XXL.